Janina Arsenjeva, originally from Estonia, was reborn a Brusseler around 8 years ago. She has since learnt French (and is learning Dutch), turned vegetarian, travelled Europe back and forth and become a proud home owner in Schaerbeek. Although a severely able-bodied person herself, she has found application for her advocacy and research skills in the disability movement, and has been on its case since 2006. Jana, professionally, you cover a very wide spectrum from human rights and disability to Yoga teaching and Ayurveda massages. Where is the crossing point? I have always worked in human rights – doing something that contributes to a better world is important to me. Diversifying my activities is the new thing. After many years of an office job (meaningful and important, but still – 8 hours of sitting down and writing), I felt I needed to add some colour to my week. Hence my yoga and massage. So I reduced my working time to 80 percent and started using my time more creatively. Doing different things actually keeps me more focused and efficient – I don’t have time to get bored or distracted. You have just started a new job as a Programme Manager at the International Federation for Spina Bifida and Hydrocephalus. What are the key challenges there? Spina bifida and hydrocephalus are complex disabilities that are the result of birth defects that affect just about 4500 pregnancies a year in Europe. Because of the rather low prevalence rate, the research into the condition lags behind and the quality of life of people affected by it suffers as consequence. We regularly receive information from families that feel completely let down and abandoned by the medical community, educators, the social workers and the society in general. In some countries, parents are even encouraged by doctors to abandon their children with SB/H who are then often left to die without medical treatment in abhorrent institutions. Luckily, this is happens less and less now, but the struggle to make sure that people affected by SB/H go to mainstream schools, receive medical services of high quality and take up employment in the open labour market continues. It is a privilege for me to be part of the disability movement. Despite being a “severely able-bodied person” myself (this is an expression I recently heard from one of the most prominent disability activists around Tom Shakespeare although as I understand it’s not originally his), equality for disabled people is something that I deeply believe in. I dream of the time when disability is so trivialised that disabled people finally get the chance to speak up about their hobbies, families and careers, instead of only being listened to when they fight for their right to take the train, or access public libraries, or receive benefits. I first met a disabled person when I was in my 20s, it’s not because there weren’t any around: the segregation in the daily life is such that I just never crossed them on my path! I’m pleased this has changed for me, and hopefully one day it will be the status quo. You were recently certified as a Yoga teacher after a training on the Bahama islands. What was it like – the training and to be doing it at such an exotic place? People rarely believe me when I say that my decision to train in the Bahamas was not prompted by the dream of its white beaches and blue ocean, but it is so! 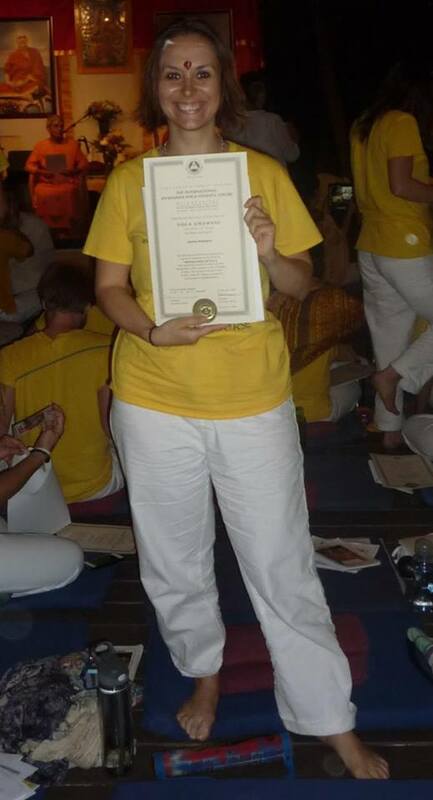 I just wanted to leave in December, and the Bahamas Sivananda Ashram held a teacher training course just at that time! What struck me the most during my month of extremely intense and demanding training (I was waking up at 4.30 AM every morning!) was the devotion with which everyone was focused on their physical, emotional and spiritual well-being. This is by no means an easy path (despite being on the Paradise Island) that makes a lot of past experiences, emotions and concerns resurface. This, combined, with many hours of daily meditation, chanting and yoga practice, was very challenging. But at the end, it was all worth it, and I feel extremely grateful and fortunate to have had this opportunity. What now? Are you planning to implement your newly acquired knowledge? I have already started teaching yoga in Brussels and am very much enjoying it. It is amazing to see the effects of yoga on the body and the mind. I hope that more and more people will integrate some yoga elements in their daily lives and keep coming back to that quiet serene place that yoga is. I practice every day (it can be just 15 minutes) and cannot imagine my life without my practice. This summer I’m taking training in accessible yoga that will allow me to teach yoga to people with disabilities and older people. This is the yoga style that permits doing many postures using a chair or other props, making it accessible to all! Why did you decide to be doing Ayurveda massage course? What is more specific about this type of massage? I’m training in Abhyanga massage which is a classical massage that uses large amounts of warm (typically, sesame, although there are variations) oil. It is incredibly relaxing and pacifying, and with the correct use of specific essential oils, it can also be a powerful healing tool. I would love to design a wellbeing programme based on three pillars: yoga, massage and nutritious food and work with women suffering from burnout and exhaustion to give them a little support for taking back the control of their lives. You are one of the greatest Brussels-lovers that I know. What do you like so much about the city? And was it love from first sight? I first moved to Brussels in 2005, after 1,5 spent living in Luxembourg and yes, it was a love at first sight! Although, as with many relationships, the things that attracted me at first are not the things I love about Brussels now. Back then, I was attracted to Brussels because of its international atmosphere, cool hangout places and delicious croissants. I also loved that it had the big-city hustle & bustle – that Luxembourg lacked without – the craziness of London (another city I’d lived in prior). What I love about it now is its multicultural spirit, hidden gems of cafes and the spirit of non-judgment. Which are your favourite spots here? I love this little café near the Bourse when you can buy Westvleteren (one of the seven trappist beers that you can usually buy only directly from the producer) – so what that it costs 12 euros!? I also very much enjoy browsing Pêle-Mêle (the second-hand bookshop that has two branches: on Ch. de Waterloo and on Bd. de Lemmonier). And of course, my favourite Sampoorna Yoga Studio in St. Catherine where I practice sometimes. How does you private Brussels look like? I enjoy not feeling like an expat here anymore. It’s my home, and I know the city very well. I go to the market, know my Turkish corner shop vendor and learn Dutch (not very successfully, I confess!). I host vegetarian dinners for friends and develop my yoga & massage practice. All the normal things, really – but these make my life here real and worthwhile. Tags: Brussels, disability, Janina Arsenjeva, Massage, Yoga. Bookmark the permalink. quick question in which I’d like to ask if you don’t mind. I was curious to find out how you center yourself and clear your thoughts before writing. Thanks for your kind words Bernardo. It’s hard to say since I have always written. The more you write the easier it gets to put your ideas into words. When you have a hard time doing so, you can just start writing without looking for perfection and edit later. Or you can leave it, do something which relaxes and inspires you till you feel your ideas are ready to be born in words. But we all have our own ways. Other tips from your experience?